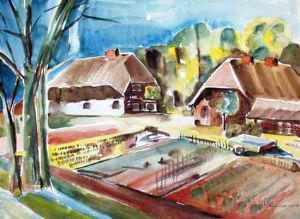 Description: Farmerhouses in Ahrenshoop 2, Watercolor, 18,7x25,8 inch, 1993, 410 Euro. Sterzenbach is a painter who creates realistic views of Berlin and its surroundings as well as figurativ, abstract and surrealistic pictures: self-willed dream figures (men, animals, sculptures, rock formations, etc.). Strange and bewitched creatures come into existence, which defy description. Theese magical, surrealistic images have a suggestive effect on the spectator. By different techniques like frottage, decalcomany, imprimitation etc. structures come into existence, which Sterzenbach assembles into fantasy figures, without having an exact imagination of what is emerging. It is quite a different world where you have to engage in as a spectator.